Anything less than 1, means that more power is required to achieve the task thus costing more. Most energy companies charge a reactive power charge for companies with a power factor below 0.95. A load with 1.0 results in the most efficient loading of the supply, a load with 0.8 results in much higher losses in the supply system and consequently a higher energy bill for the consumer. 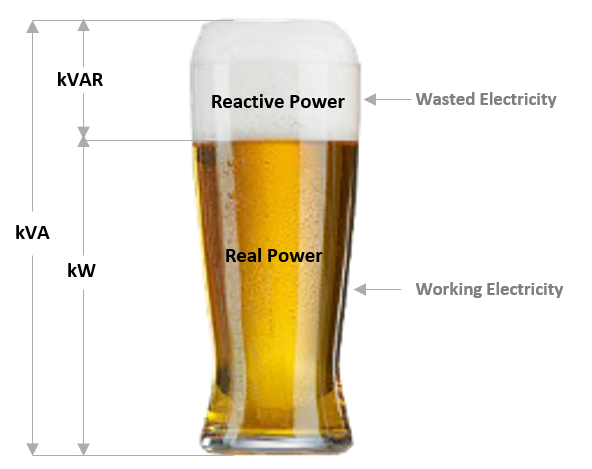 See the lager analogy below for a visual analogy of a power factor less than 1. A full pint of lager is paid for however not all of the pint is ‘useful’ the head is waste energy. So it is more desirable to have a pint of lager with as little head as possible because you still get charged the same for that pint/ unit if it is useful to you or not. This is what power factor correction does for your power systems. Power Factor Correction (PFC) is a system installed to reduce the resistive and inductive losses (impedance) reducing the apparent reactive power vectors, this in turn produces a smaller phase angle which improves the power factor. The Power Factor Correction Formula is simply the True Power divided by the Apparent Power. The end result is a figure between 0 and 1 with the best outcome being 1, which means the electrical system is as efficient as possible. Johnson & Phillips offer power analysis, site surveys and energy bill analysis to determine if a client requires power factor correction, we can also provide a comprehensive report of our findings and provide a proposal for a tailored solution. Johnson & Phillips manufacture, install, retrofit and maintain bespoke power factor correction equipment for all applications. Saving money – The installation of Power Factor Correction can make huge savings right from the start. If your power factor is 0.5 you are only 50% efficient so need twice as much electricity to power machines, by introducing power factor correction we could cut your electricity bill by up to 50% in this instance. Reactive power charge – by installing power factor correction you can reduce and, in most cases, eliminate your reactive power charge which also saves the company money. Using less energy – with increased power factor you have a supply of more ‘useable’ energy therefore the number of units used is reduced which also makes the company more economical. More capacity – by increasing the power factor, it also frees up more capacity so you can run more equipment on your existing power supply without the added expense of upgrading to a bigger supply- which can be very costly. To conclude, having a poor power factor can not only cost more, but also affect your productivity. We often propose the payback for the system is less than a year – depending on your monthly energy usage. If you need further questions answered, check out Sage Automation article. Johnson & Phillips manufacture, install, retrofit, maintain and repair power factor correction units and can create bespoke units to suit your needs. We have worked in all sectors from; healthcare to manufacture, industry and recycling, we do it all. All our solutions are suitable a range of applications including 11kV transformer and others.